This two-day course runs from 9.00am to 5.30pm in Stanmer Park, Brighton. The course provides an introduction to the theory and practice of building with hemp lime, also known as hempcrete, including how to use it in the repair and upgrading of old buildings. 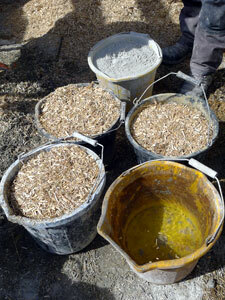 Who is the Building with hemp lime course for? This course is open to anyone aged 16 or over. It is suitable for anyone interested in learning about hempcrete construction, whether they are planning their own project as a self-builder, architect or contractor, or just wanting to gain practical experience of the different ways of using this material. No prior knowledge is assumed, so the course is suitable for complete beginners as well as those with some building experience. The course is spread over two days with a mixture of practical and theory sessions, reflecting the fact that, to use hempcrete successfully, builders need to have a proper understanding of the materials as well as good practical skills. There will be time for questions at the end of the day, but they are always welcome as we go along. All equipment is provided for practical sessions. Course participants who complete the entire course will receive a certificate, which will be sent via email after the course. 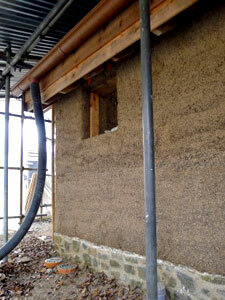 have a basic understanding of the key theoretical and practical issues to consider when building with hempcrete, in both new-build and restoration. The course will be led by Alex Sparrow, co-director of UK Hempcrete, a UK company specialising in the use of hempcrete alongside other natural building materials. Alex has been building with hempcrete since 2008 and provides consultancy and training to other builders, home owners and architects, as well as regularly speaking about the material at public events and writing on the subject. 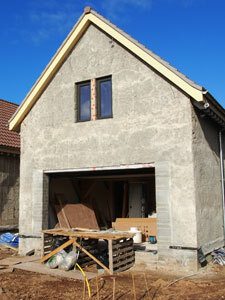 Alex is a co-author of the definitive guide to using this innovative, better-than-zero-carbon building material, The Hempcrete Book: Designing and building with hemp-lime (October 2014). "Great value for money if you intend to understand the design, construction and maintenance of buildings constructed in hempcrete. "Alex is an extremely good tutor - he knows exactly what he is talking about and is passionate about his subject." "Honestly you got the whole thing just right. Locations so apposite for those interested in sustainable planet/housing, course social dynamic nice and easy, content mix of hands-on and tutorial also just right. Well done." "Really brilliant, inspiring, comprehensive and friendly course." "A fabulous location! Friendly, open helpful and informative. Very good." "As a builder I found the course both informative, fun and full of the kind of information that only someone with passion for his work can impart." "Thank you to all involved for their hospitality and kindness. It was a truly memorable experience." "Loved the Earthship. Looking forward to coming back." "Alex's teaching was first-class, learnt more practical & usable information about the particular method of construction over the two days the course ran than I did about multiple building systems in 2 years of architecture school. "I have been on many different training courses over the past 20 years, but this one is no doubt one of the best! Beautiful venue and surroundings, as well as the people involved. It is like a short holiday break where you can learn new skills!"